Incredible 5-strand "cat fetish" necklace measures 19" with some longer strands. 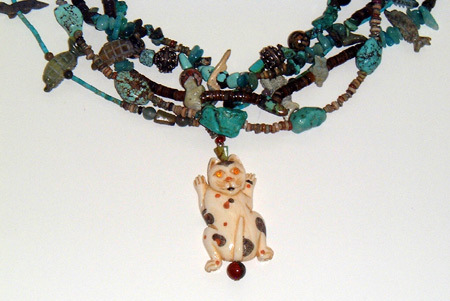 A catly interpretation of the traditional Native American fetish necklace. 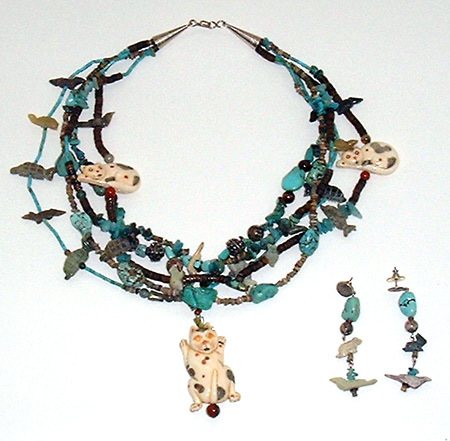 This piece uses shell, turquoise, beautifully carved bone cats, sterling beads, hand-carved Zuni fetishes, and is finished with a sterling hook and eye clasp. Truly a "treasure" cat jewelry necklace. Matching earrings are on sterling posts, with turquoise and carved fetishes, and are 2 1/2" long. Watermelon Kitty Bead Collage Necklace SALE!